The Whippet is one of the most popular of the hunting dogs. A member of the sighthound class of hunting dogs, it is bred to hunt by sight. The Whippet's keen wide range of vision gives it the ability to zero in on its prey, whereupon it breaks into a fast run to apprehend it. What makes this breed truly outstanding is its particular affection for humans. Athletic and enthusiastic while at exercise or play, the Whippet is docile and tranquil at home, and especially patient with children and friendly with guests. A cousin to the Greyhound, the Whippet gets his name from the phrase "to whip it" due to his fast pace. 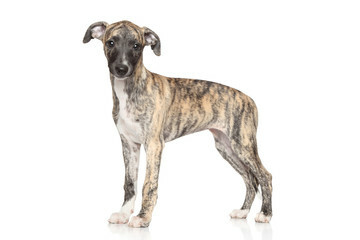 Running at speeds of up to 37 mph, the Whippet is a born hunter and racer. Referred to as "the poor man's racehorse" in early England, this breed is not only fast, but intelligent and loyal. While the Whippet is often described as gentle, this word doesn’t apply to a Whippet in pursuit of cats or other small, furry creatures. If you have bunnies or hamsters, you may want to think twice about bringing a Whippet into your home. Whippet puppies raised with other pets can coexist peacefully, but instinct is a powerful thing, so it’s essential to keep them separated when you’re not around to supervise. Like most dogs, Whippets can become bored and destructive when left to their own devices, especially if they don’t have other dogs to keep them company or if they don’t receive enough attention from family members. To counteract this, aim to walk your Whippet several times a day. You can consider taking him to a dog park at least twice a week, so he can really run. But be aware that small dogs may resemble prey to him. Whippets are suitable for apartment living if you have access to a safely fenced area where they can run. Whippets have low energy levels indoors, but will become overactive and destructive if their exercise needs are not met. When Whippets are not socialized properly they can become timid and stressed by changes in their environment. A properly socialized Whippet is a polite and undemanding dog who's wonderful with strangers and other dogs alike. Whippets aren't very good watchdogs as they rarely bark and are friendly toward everyone they meet. 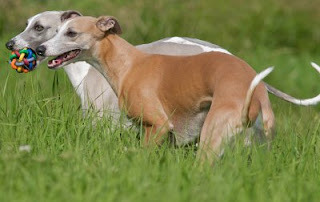 Whippets need daily exercise and will enjoy romping and running in a fenced yard or on leash. A Whippet should never be allowed to run off leash during walks. Whippets have a strong prey drive and will pursue other animals for several miles. Underground electronic fencing is not recommended for Whippets. They will ignore the shock if they see something to chase. A 5- or 6-foot fence should be enough to confine your Whippet. Whippets don't shed excessively, and weekly brushing will help keep loose hair off your clothes and furniture. A Whippet's thin skin is vulnerable to scrapes, tears, and nicks. Without daily exercise, a Whippet can become destructive. When their exercise needs are met, Whippets are generally quiet and calm dogs. Whippets are not outdoor dogs and should live in the house with their people. Whippets can suffer from separation anxiety and can become destructive when they do. It's important to spend time with your Whippet and allow him the freedom to follow you from room to room or just snuggle at your feet, or more likely on the couch with you. 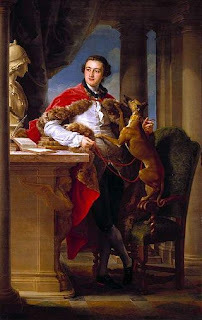 Although Whippets do very well in multi-dog households, there have been cases of Whippets attacking and killing cats. 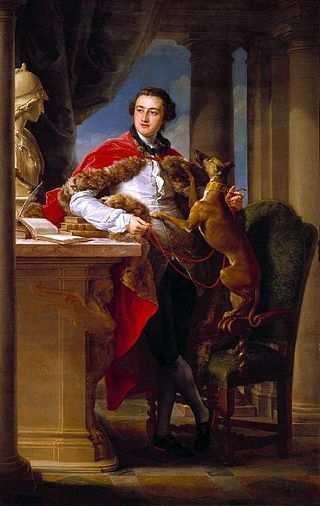 There have been some Whippets who live happily with cats and other small furry pets, but these dogs were socialized to the animal at a very young age. If you have any other small pet besides another dog, please be aware that the Whippet might chase the other pet — or worse injure it — if he's not properly socialized or trained. Whippets are great companions for kids. Nonetheless, it's important to teach your child how to properly interact with dogs and to never leave a young child alone with any breed of dog. Whippets get cold easily. Buy a sweater or coat for your Whippet to wear when it's cold, wet, or snowy outside. To get a healthy pet, never buy a puppy from a backyard breeder, puppy mill, or pet store. Find a reputable breeder who tests her breeding dogs for genetic health conditions and good temperaments. Whippets used to be known as snap dogs — for the way they snapped up rabbits and rats. 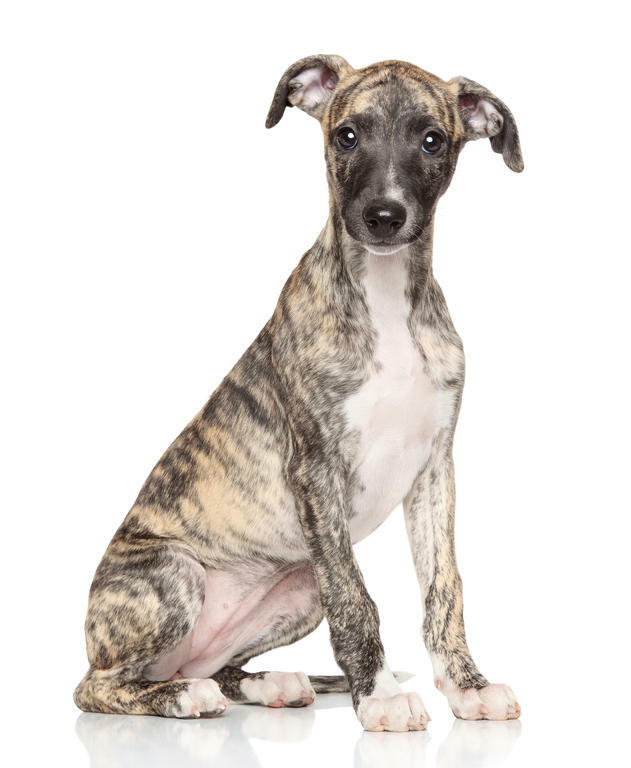 Whippet puppies are cunning little creatures, so you’ll benefit from signing up your pup for obedience classes at an early age; 10 to 12 weeks is highly recommended. The breed is revered for its graceful, athletic build, which allows the Whippet to clock speeds of up to 35 m.p.h. Read: This is not a dog that should be allowed to run off-leash in open spaces. 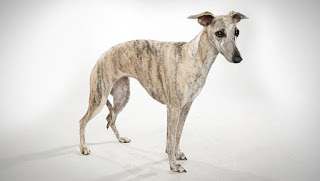 Other identifiers: A medium-sized thin and long body similar to the Greyhound, long slender head shape, with a long muzzle and tapered black or blue nose, darks eyes in an oval shape, short ears folded back, long and lean straight legs, and long tail that curves upward. 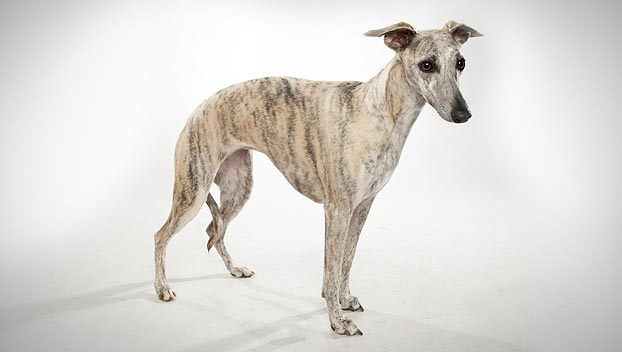 Amiable, friendly, quiet, and gentle at home, the Whippet is intense in the chase. He requires a leash or a fenced yard to prevent him from taking off after any moving object, be it a bunny or a radio-controlled car. He doesn't bark much, but he's alert and makes an excellent watchdog. Guard dog? Not so much. He'll happily show the burglar to the silver. Temperament is affected by a number of factors, including heredity, training, and socialization. Puppies with nice temperaments are curious and playful, willing to approach people and be held by them. Choose the middle-of-the-road puppy, not the one who's beating up his littermates or the one who's hiding in the corner. Always meet at least one of the parents — usually the mother is the one who's available — to ensure that they have temperaments that you're comfortable with. Meeting siblings or other relatives of the parents is also helpful for evaluating what a puppy will be like when he grows up. Like every dog, Whippets need early socialization — exposure to many different people, sights, sounds, and experiences — when they're young. Socialization helps ensure that your Whippet puppy grows up to be a well-rounded dog. Enrolling him in a puppy kindergarten class is a great start. Inviting visitors over regularly, and taking him to busy parks, stores that allow dogs, and on leisurely strolls to meet neighbors will also help him polish his social skills. Whippets do not require a great deal of maintenance. However, as an athletic breed, they do need to be taken out for exercise regularly, with a combination of running and walking. Because they are natural sprinters, they cannot run for prolonged distances, but they thrive when they are able to run with some freedom and space to get to their top speeds. These dogs love to play in the snow but cannot stand cold weather for a long time and cannot be kept as outdoor pets owing to their short coats and lack of heat retaining body fats. The main part of their time should be in a warm environment, with an access to a soft bed inside the house. Regular grooming should be part of overall care, though Whippets do not tend have the typical body odor that is associated with dogs, again owing to their short, fine coat. This breed is sensitive to the cold. Wearing a coat is advised in the winter. These dogs will do okay in an apartment if they are sufficiently exercised. Whippets are calm indoors and a small yard will do. 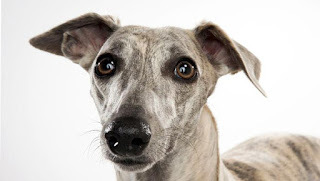 Whippets are actually known as sensitive breeds, which mean they should not be over trained. Special care should be taken to avoid negative reinforcement. Instead, positive reinforcement will help develop a natural and healthy self-esteem, as it is easy to “cross over the line” with Whippets and confuse them as to why you’re angry or impatient. A good trainer will be able to handle a Whippet with relative ease. Though they love to run and are prone to unprompted laps around the house or yard, you don't need to be a runner yourself to raise this breed. Whippets should be allowed to run several times a week, but they are not built for endurance activities. A few sprints around the yard or track and a Whippet is done for the day, happily retiring to his bed for some rest and relaxation. They are fine city dwellers, as long as they are allowed to get to a park for regular sprints. Other than that, regular walking will keep the Whippet happy and healthy. Their size and quiet natures makes them suitable for some apartments, but there should be enough room to accommodate random fits of running. 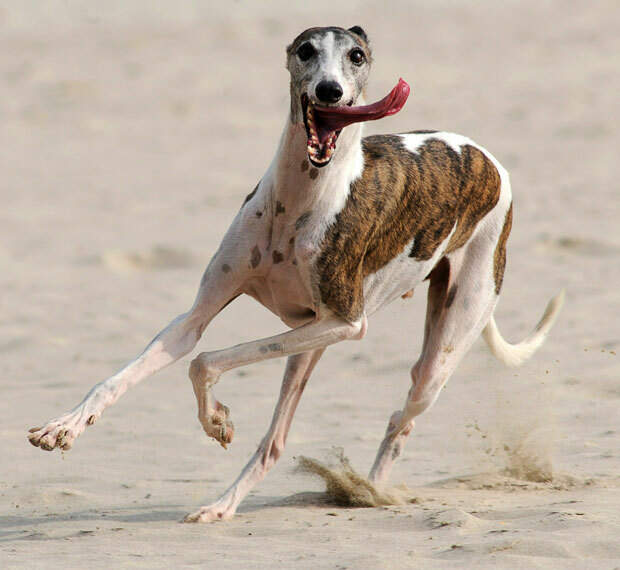 Taking your Whippet to the lure course where he can run at top speed is an excellent way to keep him in shape and meet his exercise requirements. The Whippet's coat only needs to be brushed with a hound mitt once per week to remove loose hair and keep the coat healthy. They only require bathing as needed. The thin coat of the Whippet does not protect well against cuts and scrapes, so he may be more prone to minor skin injuries than other breeds. Be sure to clean all wounds, even minor wounds, to prevent infection. Check the ears on a weekly basis for signs of infection, irritation, or wax build up. Cleanse regularly with a veterinarian-approved cleanser and cotton ball. Brush the teeth at least once per week to prevent tartar buildup and fight gum disease. Additionally, nails should be trimmed once per month if the dog does not wear the toenails down naturally. Whippets enjoy playing with kids. They're not so large that they knock them over easily, and they're not so small or delicate that they're easily injured by them. That said, a few ground rules will keep everyone safe. 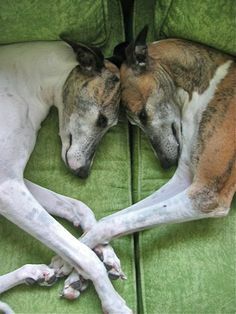 Whippets like the company of other dogs, and the presence of another dog or two can help keep them from being lonely if you're gone during the day. They have a high prey drive, however, and aren't really suited to living in homes with cats. It's their nature to chase small furry creatures, after all. Some Whippets can learn to live peacefully with cats, especially if they're brought up with them from puppyhood, but you should always supervise them when they're together and separate them when you're not home. 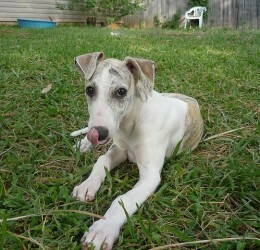 Great with children that do not play rough, the Whippet is a devoted and quiet family dog. Docile and easy to maintain, these pets are awesome to travel with and take care of. Best suited for warmer climates, the Whippet will need a coat if taken out in a cold climate. Sensitive, they're on the easier side to housebreak and are OK for apartment living if taken out for regular exercise. Trained and prone to hunting, these dogs only do well with cats if raised with them. They do best living in a home with a small yard and as an inside pup. Whippets were introduced to America by English mill workers who settled in Massachusetts and eventually turned the state into a mecca for Whippet racing. Waking up ready for affection from his owner, the Whippet will loyally watch the house once you leave for the day. Going out occasionally for a run around the yard and a sniff for any animal intruders, he'll spend most of the day tucked away indoors. A loving pat from the kids and a reserved glance at the neighbors and he'll keep himself entertained. After his best friend arrives home, he'll be ready and waiting for his daily run. Once home, he'll loyally sleep at your feet until you both hit the hay.